We bring all of the electronics in your Dallas area home together with Elan, Control4 and Savant home automation systems. Automating your home will enable you to control electronics such as cameras, heating, lighting, water shut-off, sprinkler systems, swimming pool controls, spa controls, appliances and air-conditioning systems. Set the mood with lighting, temperature and your favorite music at the touch of a button. Our home automation systems intuitively create perfect moments by applying your preset preferences to an infinite selection of media. Whether your entertainment is in one room, throughout your home, or even outdoors, our Elan, Control 4 and Savant smart home systems make it easy. Don’t let the Texas heat drive up your electricity bill. With a single tap, remotely control your thermostat, lighting, and shades, maintaining the perfect level of comfort while you’re home—and conserving energy when you’re traveling outside of DFW....anywhere in the world for that matter. You can even monitor usage through the system’s detailed history of your energy consumption. Would you like to be able to enjoy your spa or pool as soon as you come home? The Elan Home Automation system makes enjoying your pool and spa even easier by maintaining pumps, lighting, and even automated covers. The system can even control your sprinkler system, enabling you to conserve water by setting up personalized schedules. Savant and Control4 have similar control, not just of your house, but your entire property. Speakers by the pool cotrolled by Alexa? Check. Coastal Source landscape lights turning on if your security system goes off? Check. Surveillance cameras alerting you to motion on your porch? Check. Lights turning on (via Lutron) when you open the garage door? Check. Protect what matters most with more than a locked door. ELAN, Control4 and Savant integrate seamlessly with top security systems from DSC, Honeywell and GE —giving you complete peace of mind, for anywhere in the world. With just a single touch of a button either system can turn off the lights, ensure the garage is closed, doors are locked, and your security system is activated. With the convenience of remote access, you can receive alerts, arm, or disarm the system from your mobile device—whether you're at home or a thousand miles away. The Elan Home Automation System also helps in the case of an emergency. If the smoke alarm is triggered, the system immediately shuts down your HVAC system, minimizing the spread of smoke. While emergency response is being notified, Savant can light internal and external pathways to help your family exit quickly. A single interface lets you enjoy consistent experiences across multiple devices; from your system remote, touch panel, tablet or smart phone. 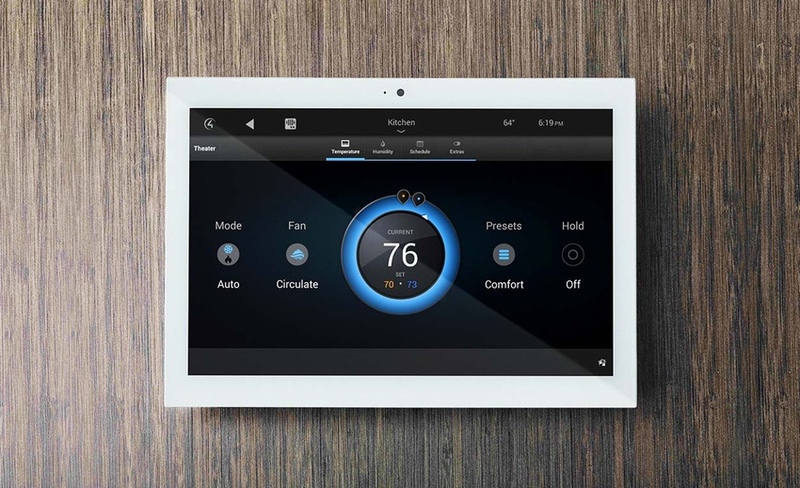 The Comfort and Convenience of an Elan, Control4 or Savant home automation system will make you more comfortable, while saving you time and money, and simplifying the management of your Dallas area home.